The term obesity is associated with overweight individuals. It is basically an epidemic problem of abnormal accumulation of neutral body fat as compared to body size. It has become more prevalent in young age especially children now a days. Children are heavier today than they were 20 years ago. The overweight children looks very cute but these cute children are actually over nourished and unhealthy individuals. 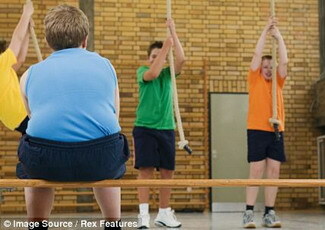 The incidence of childhood obesity is increasing especially in developing countries with unhealthy lifestyles. There are many social, economical, environmental and hereditary factors which can lead to obesity. Too much eating: When the child eats too much, it is very sure that he will consume a large number of carbohydrates and sugar on daily basis which will make him obese. Sometimes these choices are less than healthy options, like pizza and French fries, burger, patee, candies and cola drinks. Mostly children get this stuff from school canteen. A high intake of fat: children who prefer fatty foods tend to be more overweight. Their body stores more fat and fat percentage in their system gets increased. Fat preferences made by children also related with the unhealthy parental environment and heavy advertisement of junk foods by media. Parental obesity: If the both parents are obese than there are double chances that the child will be an obese adult. If one parent is obese, there are fewer chances. Genetics: “Twin studies” research that genetics plays a role in obesity. Identical twins that have the same genes system are more prone to obesity than the non identical ones. Rate of metabolism: the metabolism (chemical reactions takes place in body) and a metabolic rate of a child affects a lot. The children having increased metabolic rate are tend to be normal and sleek and those with decreased metabolic rate are obese. Hypothyroidism: This condition includes low or nil production of thyroxin by thyroid glands in children. It is more common in children living in mountain areas. Obesity due to this problem is not related with the other mention causes. It is an hormonal imbalance which can decrease the rate of metabolism also. Physical inactivity: children usually grow more overweight because of their inactive lifestyle, no matter how less they are eating. Today children are not interested in playing physical games but they prefer to watch games on television. Watching television: It is a most favorite practice among children. Watching television estimates for some 24 hours a week of sedentary behavior. Beside television children spend more time sitting at computers and playing video games. These activities give no energy but resting and foster snacking and high fat goods.